Santogold’s “Unstoppable” is a great song. And I don’t doubt its power to ignite a massive live concert swarming dance party. And it’s a great anthem for this story, too. 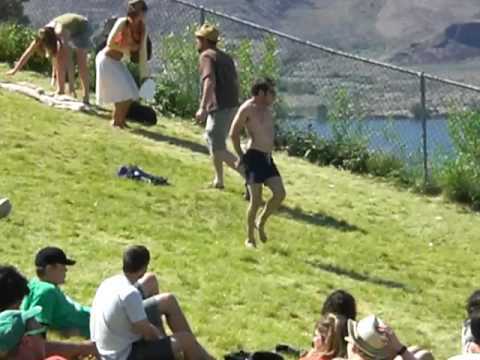 But when I first watched the YouTube video from last month’s Sasquatch Festival where this “Dancing Guy” starts a dance party during Santogold ‘s “Unstoppable,” I too was inspired like all the other who watched the video. But after watching it several times I began to wonder if it was really real. I wondered if it was staged. Why would I wonder this? Well, first off, having been in concert crowds at festivals before, I’ve seen guys like this Dancing Guy before. And rarely does anyone else ever rise to their feet to join them like the swarm of people did with this guy. I always wished someone would but it never happens like this. So as I viewed the other YouTube videos that captured the Dancing Guy ten minutes before and during the Swarm, I noticed that the response seemed to be more on the artificially manufactured side. And I wondered if a crafty fan was creating their own live concert fantasy for their own person kicks and or to create a thrilling YouTube effect. The other things that make me think this might not be a true fan response are case studies in social psychology, community psychology and other socialogical documentation of human behavior, specifically things like social loafing and the bystander effect documented in the 1964 Kitty Genovese murder case. All these studies of group behavior show that group reactions like the swarming fan response to the “Dancing Guy” seem a bit odd and fantastically manufactured. Again, I’m not hating on anyone or trying to be a buzz kill. I’m a huge fan of Santogold and I fully support any healthy, genuine and spontaneous explosion that expresses joy and pleasure. I’m just questioning the masses because this was so oddly fantastic and different from normal fan behavior I’ve seen at concerts. And if this is a true and actual spontaneous concert fan response caught on video, then what we have here my friends, is a true live concert phenomenon that we should treasure and think about recreating more often at concerts. Here’s two of the videos that I watched. Tell me what you think. I’m the one that posted the first video. I don’t think the event was staged at all. I’d seen the guy earlier throughout the festival and he was doing pretty much the same kind of dance “routine”. But what the videos don’t portray is that a lot of people had been approaching him everyday of the festival. I think a lot of people were doing it mockingly (“Look, I’m playing with the retard!”), but some were genuinely those type of people to join in and dance. I think what you see is the culmination of those latter type of people. Thanks for the insight and background info, Mason. I was hoping that it wasn’t staged and I always hope that concert fans can just let the moment take them without having it be planned. It’s also great to learn about what happened to the Collin (Dancing Guy) once the crowd swarmed around him. I hope I can interview him and get a first hand account of what it was like to have created such a swarm of fans and then ditch the party. This type of thing is typical at Sasquatch Fest.. I recommend you go a see for yourself. I believe it was “staged”, but not in the scale you are implying. The triggering events was not made by many single individuals, which seems to be your underlying assumption. There were groups of people who decided to join, this makes the case different. In cases were individuals do not interfere when common logic say that they should, I believe the case would be different if a group of 5 close friends were expected to interfere by common logic. Our groups are our shields, and we feel and act different being around a bunch of people we know well. A group being at least more than three individuals. A group of 10 friends are sitting in a circle, drunk, high or whatever, they’ve been paying attention to the guy dancing for some time and some of them may say “hey we should just run down there and join”. So imagine if there were many of these groups paying attention, you would just need some few people in the group with influence to say “yeaah let’s go!, cmon cmon!”. Now if there were just a bunch of singles and duos the effect we saw probably wouldn’t have occured. But in this case people act different when they are around a big group of close friends. My point here is that this can happen because GROUPS of friends decided to run in. There are many individuals and duos that dance with him through the video, but it’s finally when a big group of people come running down that the mania starts. This group of people were probably a bunch of friends sitting together eager to dance, and I can imagine the situation “cmon let’s go dance!” by 2-3 of them, finally all of them are in and they run down TOGETHER. How do you think generals led armies clashing straight into each other in arms combat in former days? Humans act different when they feel like a part of a unity, while you are refering to an effect happening when people are not part of a unity. This is logical, humans are pack animals and therefore we withdraw when there is a sense of uncertainty. In an unexpected scenario we don’t play sherlock holmes if we’re alone. At least the majority of us.